The last Ford Mustang Mach 1 was offered in 2003 and 2004 as a sort of step-package that offers better performance than the Mustang GT but lower performance capabilities than the mighty SVT “Terminator” Cobra Mustang. There have long been rumors that Ford planned to bring back the Mach 1 Mustang that would follow in the tradition of the 2003 and 2004 models, sitting between the 2015 Ford Mustang GT and the new GT500 replacement that could be called the GT350 or the SVT Cobra. Should this direction prove to be reality, this modern Mach 1 would likely be similar in its function to the 2012 and 2013 Mustang Boss 302 that offered more power and better handling than the Mustang GT. However, with rumors suggesting that the 2015 Mustang GT will have comparable horsepower to the previous Boss 302, the new Mach 1 would need a bump in power to differentiate itself from the GT models. Something in the 500 horsepower range would present a significant improvement in power over the Mustang GT while still leaving plenty of space for the top of the line model (currently the GT500 – could be the GT350 or 2015 SVT Cobra). The next possibility for the Mach 1 name is that it wouldn’t serve as a mid-level performance model between the 2015 Ford Mustang GT and the new SVT Mustang but instead, it would replace one of those models. It is all but official that the next generation Mustang will have some sort of ultra high performance model that will effectively replace the current Shelby GT500 and one of the possible names that has come up for the replacement name was Mach 1. There is also the possibility that the Mach 1 would be the volume V8 performance model, effectively replacing what we know today as the Mustang GT. It wouldn’t seem very likely that Ford would kill off the popular Mustang GT package but when you consider the fact that Ford replaced the Mustang GT with the Mach 1 back in 1970 – it seems slightly more possible. Another interesting possibility is that the new Mach 1 could introduce the modern Mustang fastback. While the current Mustang has a very short trunk lid area and the 2015 Mustang is likely to have an ever shorter trunk – it has been many moons since Ford offered an actual fastback Mustang. The 2015 Ford Mustang likely won’t be a fastback but if Ford followed the path of the Mach 1 from back in 1969, the 2015 Mach 1 could be the first true modern Mustang fastback. 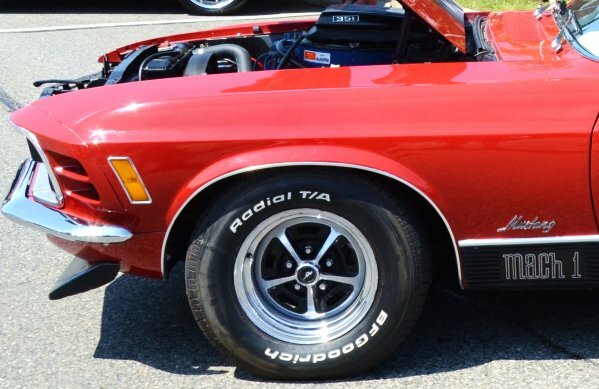 The last – and least interesting – possibility is that Ford Motor Company trademarked the Mach 1 name to make sure that some other automaker cannot use it. Should this be the case, Ford may not have any plans at all to use the Mach 1 name on a new Mustang model and trade marking the name is simply a way to protect the legendary moniker. The 2015 Ford Mustang is expected to debut in some way in December of this year so it may just be a couple more months until we get a very good look at the newest generation Mustang – along with more information on the trimlines of the next generation pony car.